If you recall, back in 2002 the US government launched an expensive propaganda campaign in its failed “war on drugs” aimed at tying the recreational use of drugs such as marijuana and cocaine to terrorism. The ads, one of which aired during the Super Bowl, equated the use of illegal drugs with the killing of civilians, police and judges on the basis of the claim that money earned through the illicit drug trade is used by terrorists to finance their organizations and operations. The ad campaign was widely mocked at the time. The Libertarian Party stepped up to fund an ad which pointed out that it is the “war on drugs,” beloved by the Republican and Democratic parties, that sustains the international drug cartels, and drew the implicit conclusion that, if you support Democrats and Republicans, you support terrorism. “Wachovia’s blatant disregard for our banking laws gave international cocaine cartels a virtual carte blanche to finance their operations,” said Jeffrey Sloman, the federal prosecutor. Yet the total fine was less than 2% of the bank’s $12.3bn profit for 2009. On 24Â March 2010, Wells Fargo stock traded at $30.86 – up 1% on the week of the court settlement. The conclusion to the case [against Wachovia] was only the tip of an iceberg, demonstrating the role of the “legal” banking sector in swilling hundreds of billions of dollars – the blood money from the murderous drug trade in Mexico and other places in the world – around their global operations, now bailed out by the taxpayer. At the height of the 2008 banking crisis, Antonio Maria Costa, then head of the United Nations office on drugs and crime, said he had evidence to suggest the proceeds from drugs and crime were “the only liquid investment capital” available to banks on the brink of collapse. “Inter-bank loans were funded by money that originated from the drugs trade,” he said. “There were signs that some banks were rescued that way.”Â Wachovia was acquired by Wells Fargo during the 2008 crash, just as Wells Fargo became a beneficiary of $25bn in taxpayers’ money . . .
Mazur, whose firm Chase and Associates works closely with law enforcement agencies and trains officers for bank anti-money laundering, cast a keen eye over the case against Wachovia, and he says now that “the only thing that will make the banks properly vigilant to what is happening is when they hear the rattle of handcuffs in the boardroom”. Mazur said that “a lot of the law enforcement people were disappointed to see a settlement” between the administration and Wachovia . . .
Read the whole article for all the gory details. Let’s sum up the situation here. The war on drugs supported by the Democratic and Republican parties sustains the international drug cartels. These international drug gangs sustain the global banking system. The global banking cartels, in turn, support the Democratic and Republican parties with massive amounts of campaign contributions. It’s a pretty tidy system the Republicans and Democrats have created for themselves. The act of publishing information is not warfare. Wikileaks is not warfare. Just because Julian Assange thinks of himself as a freedom fighter, and just because Wikileaks’ supporters like to imagine themselves fighting an “Infowar”, doesn’t make it true. If we allow our definitions of war and conflict to blur, then we bring the government’s aggressive response on ourselves . . . As someone who engages in journalism, as someone who engages in activism and dissent, I don’t want these things re-defined as an attack on the state. The problem, however, is that the state has already prepared the conceptual groundwork to promulgate a redefinition of such acts and actions as part and parcel of an ongoing information war. Bob writes in response: “It’s not asymmetrical armed warfare, to be sure, but the tactics are the same, so perhaps we should call it asymmetrical info warfare.”Â In fact, Cablegate – understanding that term in the widest sense, to include the actions of Wikileaks as well as the response by agents of the state, individual citizens and other non-state actors – has virtually all the markings of an information war as that term has been re-defined and re-conceptualized by the state. 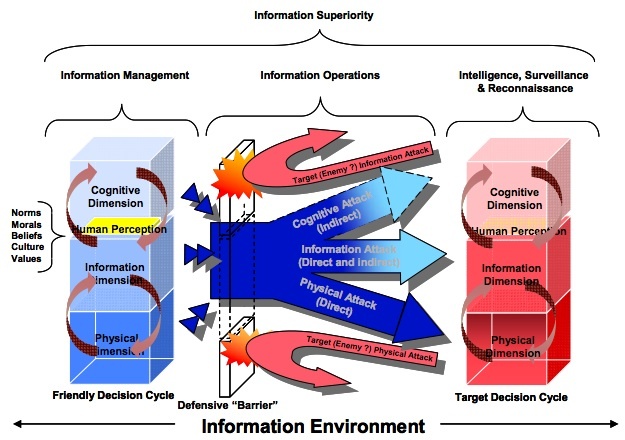 The “information environment” – the abstract space in which information warfare and information operations are carried out – has physical, informational, perceptual, cognitive and social dimensions. Thus the potential informational battlefield stretches from the tangible real world, to cyberspace, to the individual human mind, to society as a whole. As such, information warfare allows for a form of total war the likes of which were literally impossible before the dawn of the information age. One of the primary characteristics of total war is the erosion of the distinction between civilians and combatants. The complete collapse of this distinction is axiomatic for radical terrorist groups such as Al Qaeda. The maintenance of this distinction represents a primary difference between civilization and barbarism. For this reason, if for no other, it is imperative to defend the freedom of speech and of the press against any and all who would seek to argue that any such act of speech or press constitutes an act of war. Cross-posted and adapted from Poli-Tea. tomorrow Republicans will send more Republicans to Congress than at any time in the past 80 years . . . This isn’t a wave, it’s a tidal shift—and we’ve seen it coming for a long time. . . . But none of this means that Republicans are winning. The reality is that voters in 2010 are doing the same thing they did in 2006 and 2008: They are voting against the party in power. . . . This reflects a fundamental rejection of both political parties. Most voters expected Republicans to win control of the House of Representatives on Election Day, but nearly as many expect to be disappointed with how they perform by the time the 2012 elections roll around. A new Rasmussen Reports national telephone survey finds, in fact, that 59% of Likely U.S. Voters think it is at least somewhat likely that most voters will be disappointed with Republicans in Congress before the next national elections. That includes 38% who say it is Very Likely. Democrats have a 10-point favorability gap: 43 percent of voters have a positive opinion of the party, while 53 percent aren’t thrilled. The Republican Party also gets a thumbs-down from 53 percent of the nation’s voters, with just 41 percent saying they’re happy with the party. Compare that with 1994 and 2006, when voters had a net positive view of the incoming party. The numbers suggest Tuesday night may signal a rejection of the Democratic Party — but something less than an embrace of the GOP. Signs and symptoms of the depressive phase of bipolar disorder include persistent feelings of sadness, anxiety, guilt, anger, isolation, or hopelessness; disturbances in sleep and appetite; fatigue and loss of interest in usually enjoyable activities; problems concentrating; loneliness, self-loathing, apathy or indifference; depersonalization; loss of interest in sexual activity; shyness or social anxiety; irritability, chronic pain (with or without a known cause); lack of motivation; and morbid suicidal ideation. Mania is generally characterized by a distinct period of an elevated, expansive, or irritable mood state. People commonly experience an increase in energy and a decreased need for sleep. A person’s speech may be pressured, with thoughts experienced as racing. Attention span is low, and a person in a manic state may be easily distracted. Judgment may become impaired, and sufferers may go on spending sprees or engage in behavior that is quite abnormal for them. They may indulge in substance abuse, particularly alcohol or other depressants, cocaine or other stimulants, or sleeping pills. Their behavior may become aggressive, intolerant, or intrusive. People may feel out of control or unstoppable. People may feel they have been “chosen” and are “on a special mission” or have other grandiose or delusional ideas. Sexual drive may increase. If you are someone you know exhibits any of the above symptoms, contact a political professional immediately for appropriate doses of partisan spin and propaganda. Of course, this does nothing but mask the symptoms of the illness. Political independence may be the only viable, long-term treatment for Democrat-Republican bipolar disorder. Follow Obama and Biden’s advice: Consider the alternatives! What’s with telling the Democratic base, your base, to “stop whining“?Â Sure, I get your point — as inartful as it was. If you put Democrats up against Republicans, and if Democrats are compared to “the alternative,” the choice should be clear, and Democrats, suffering from a lack of enthusiasm, should step up and do what needs to be done to prevent the Republicans from winning big this November. In other words, the supporter of the two-party state thinks he has a choice when in fact there are no alternatives. Indeed, partisans of the two-party state are so blinded by the ideology that maintains it, they see two choices where in fact there are no alternatives. The good news is that there are numerous alternatives to the false choice between the Democratic and Republican parties that has been forced upon us by the ruling corporate-political class. From a principled liberal or progressive perspective, left-leaning Independents, the Green party, the Socialist parties, even the Libertarian party, represent a superior alternative to the reproduction of the reigning corporatist two-party state. If you call yourself a liberal or a progressive, but you support Democrats, in what sense are you a liberal or progressive?Â By your actions you do nothing but provide popular political cover for a primary faction of the global warfare and corporate welfare state. Adapted from a post at Poli-Tea. What are the year’s best political ads for third party and independent candidates (so far)?Â Over the last week, I’ve viewed dozens of political ads and short videos produced by and for Libertarian, Green, Constitution Party and Independent candidates for office from Maine to California and Florida to Washington . . . From this unscientific sampling of videos, it is safe to conclude that there are some very savvy and extremely creative ads out there, and probably many many more which I still have not seen. . . .
Because of the prejudices and biases against third party and independent candidates, not to mention the ideological and structural constraints imposed on the American people by the two-party state, third party and independent candidates must be extremely creative in their ads to raise their political profiles and garner notice from the public and attention from the media. It is those ads which diverge from the generic model that I have highlighted below. Best Ad: Glenn Wilson vs. The Dons. Glenn Wilson is an Independent candidate for Congress in Michigan’s 1st district. In this ad, Republican and Democratic mafia bosses hold a meeting to determine what to do about Independent candidate Glenn Wilson, whose candidacy threatens their political monopoly. They decide not to “whack the voters” just yet, but instead call for a media blackout of coverage on the Independent candidate.